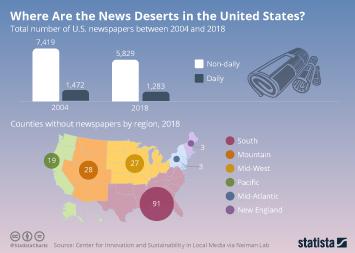 Although the newspaper industry isn’t quite the media behemoth that it was in the past, it still managed to generate around 87 billion U.S. dollars in revenue in 2017. Print remains the predominant method of consumption, but figures show that the global newspaper industry is shifting towards digital platforms. As of 2015, there were four billion newspaper readers in the world, with 1.3 billion of these being digital readers. Digital newspaper industry revenue is forecast to grow by 9.8 percent annually from 2015 to 2020; whereas non-digital is forecast to experience a decline of three percent per annum during the same period. Consistent with the global figures, the newspaper industry has seen better days in the U.S. Consumption of newspapers is expected to decline considerably in the coming years. In 2015, Americans spent an average of about 17 minutes per day reading newspapers, but as of 2018, American consumers only dedicate 12 daily minutes to the medium. In terms of digital platforms, digital consumption in the U.S. newspaper market again falls in line with that of the global market. Print is still dominant, as over half of Americans only read print newspapers; however, a growing proportion of consumers couple their traditional consumption of print media with newer forms such as web and mobile. This change in consumption is reflected in the industry's employment and revenue figures. Employment is undergoing critical cuts, with figures down from 256,800 employees in 2010 to 173,709 in 2016. Revenue of the newspaper industry in the U.S. is forecast to drop from around 28.7 billion U.S. dollars in 2018 to 27 billion U.S. dollars by 2020. Newspaper publishers’ key source of revenue, advertising, is also projected to shrink in the next years. Newspaper advertising spending is expected to fall to around 14 billion by 2020, after peaking at over 53 billion in 2006. The top newspaper advertisers in the U.S. are Anderson Corp, Macy’s, and News Corp. Macy’s spent 76 million U.S. dollars on newspaper advertising in 2017. The Wall Street Journal is the leading newspaper in the U.S. in regards to circulation. The New York Times, Chicago Tribune, New York Post and Los Angeles Times complete the top 5 list of biggest daily newspapers in the country. The New York Times has the largest presence on Facebook, with over 25 million interactions on its page in 2017.